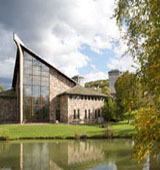 "The "other" college in Ithaca, NY, is Ithaca College, "a wonderful institution" that originated as a Conservatory of Music and has grown into a nationally renowned pre-professional college with a "highly diverse curriculum" and one of the premier physical therapy programs on the East Coast. Communications is big as well, and the "absolutely gorgeous" campus is only five minutes from "Cornell, a state park, or the countryside." Describe the type of student who should not attend Ithaca College and explain why. Describe the type of student who should attend Ithaca College. Why? What is a typical Ithaca College student like? Describe the type of person that should attend Ithaca College. It is so easy to find where is recycle bin in windows 10 and it is looking easy for me to get the recycle bin here. What are the top 3 reasons someone should attend Ithaca College? Ithaca has a large queer community, and has been voted the top LGBT friendly college town several years in a row. The land surrounding Ithaca is breathtakingly beautiful, and people are committed to keeping it that way. What was a typical Ithaca College student like in high school? Describe the type of person that should attend Ithaca College. I'd like to think that most Ithaca College students were very welcoming, passionate and friendly in high school. Everyone on campus is very relaxed and very excited about their major and opportunities for their futures. Outstanding programs in the arts and media. Students also clamor to get into physical therapy. It now offers strong academics in addition to a world-class music program. 49 percent of incoming freshmen [were] in the top 15 percent of their high school class. Ithaca is internationally recognized for its rigorous communications, music, and health science programs. You might say that Ithaca College began with a letter from Berlin. Ithaca-area native William Grant Egbert -- Will to his friends -- was a young, homesick violinist studying in Europe when it occurred to him that the best way to live at home and still make a living would be to do what he did best. He could play his violin, and do it in Ithaca, if he taught music on a grander scale. So he wrote a letter to an Ithaca friend, instructing him to sell $50 shares in a new conservatory of music. There weren't many takers. Nonetheless, on September 19, 1892, the first students trooped into four rented rooms in a house on East Seneca Street to begin their lessons. On that first evening, the faculty of the Ithaca Conservatory of Music gave a free concert in the Unitarian Church, the beginning of a tradition of public performances. Conservatory officers busily set about finding boarding -- "places carefully selected among Christian families" -- for their new students, who studied everything from solfeggio and composition to guitar, mandolin, and even china painting. For years the fledgling Ithaca Conservatory of Music rented space in the old Wilgus Opera House above Rothschild's Department Store, where Center Ithaca stands today. But by 1910 the management of the school longed for permanent quarters. On November 1, 1910, the directors authorized taking out a mortgage of $11,400 to purchase Judge Douglass Boardman's handsome Italianate townhouse at 120 East Buffalo Street, adjoining DeWitt Park. The Ithaca Conservatory of Music quickly became more than just a music school. By 1897 George C. Williams had arrived to inaugurate courses in elocution and rhetoric. Williams was an irrepressible character who turned his aspirations for the pulpit into a love of the stage, and here was born the College's long-standing theater arts program, with Williams in the leading roles in everything from Shakespeare to Gilbert and Sullivan. We acted our hearts out, made music in the park, filled the church choirs with wonderful voices, and generally added life to the culture in Ithaca. What are the top 3 things that students do for fun at Ithaca College? Go out to eat any of the myriad of restaurants in the Commons. Attend on campus musical, theatrical, or literary performances and festivals. Go to the Gorges and appreciate the beauty of the natural land just five minutes from campus. 68% of students live on-campus. The average student pays $32,769 for tuition, fees, and other expenses, after grants and scholarships. Total stated tuition is $38,400, in-state and on-campus, before financial aid. Learn more about financial aid at http://www.ithaca.edu/finaid/. Estimate the net price for you at http://www.ithaca.edu/finaid/aid/need/. The typical (median) early career salary of Ithaca College graduates is $41,800, according to Payscale. Ithaca College participates in the NCAA Division III for college athletics. Want more info about Ithaca College? Get free advice from education experts and Noodle community members. What do you like about Ithaca's campus and culture? What is the percussion department's email address. Who is in charge of the program? Gordon Stout is professor of percussion at Ithaca College and you can reach him at (607) 274-3427 or [email protected]. How popular is the School of Music at Ithaca College? The School of Music at Ithaca College is ranked in the Top 100 Music Programs within the U.S. For more information please visit the Top 100 Music Programs website.